This high school’s original building is said to the haunted. Classrooms on the second floor fall victim to the hauntings where the ghosts turn off electronic equipment. The theater is the most haunted part of the building, however. It is said that a girl had died while in the theater along with a drama instructor who died of a heart attack. Lights turn on when they’re not plugged in, stage lights change colors, other lights fall barely missing witnesses, and things mysteriously move on their own. There is an overwhelming smell of perfume at times, whispers can be heard when no one else is there, and there’s a feeling of being watched. 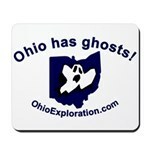 The local school board denies the hauntings are valid. It is said that one can sometimes see the apparitions of school children playing and dancing who died in a horrible fire. They have been known to play tricks on visitors to the fair. A home along Carroll Avenue is said to be haunted by the ghosts of two former residents, among others. The former residents are known as the Olmstands. It is said that Mr. Olmstand died when he fell in the bathroom, hit his head on the tub and bled to death. Mrs. Olmstand died after a fall down the cellar stairs. Witnesses have seen Mr. Olmstand standing by the bathroom door wearing a housecoat and slippers. Mrs. Olmstand has been spotted in the attic sewing room and at the kitchen stove. Three ghostly Civil War soldiers have been seen in the basement. The home was built in 1945 atop a former Civil War encampment.